Your metal dog collar got rusty and now looks ugly on your pet's fur? Who said that you can't change it for one that will never rust? Have you ever heard about Black Stainless Steel dog items? If not, please, draw your attention to this stylish looking Stainless Steel Dog Choke Collar that will be a great helper for you and your four-legged friend for many years. Does it sound interesting and absolutely new? Try it now and see for yourself! The trendy look of the collar is not the only beneficial feature of the gear. The most important goal of the item is a protection of your canine's beautiful fur thanks to its smooth and well polished links. Be it an ordinary everyday walking or behavior correction training, the dog will feel comfortable with the metal collar on his neck. 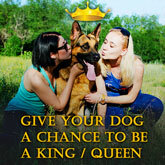 Make usual daily activities with your pet extraordinary and much more effective! It is important to mention that this choke dog collar is produced of very durable and long-lasting metal - Black Stainless Steel. This type of metal is famous for its sturdiness and durability. Besides, it is resistant to rust and will keep its wonderful look throughout the years. The weight of this Stainless Steel Fur Saver Collar depends upon the size and varies between 3.3 oz - 5.5 oz (95 g - 155 g). The diameter of the link is 1/8 inch (3 mm). The width of the gear is 1/3 inch (10 mm). Please, don't leave your Canine wearing this metal collar without your control, as he may accidentally get hurt. For a puppy, it is strongly recommended to choose the size of the gear that fits him now. The bigger sized one will not have any results in the training process. Don’t select the size of the gear that fits right up to your pet’s neck dimensions. As a result, the dog will get used to the constant pressure and the collar will not have any training effect.